Lyft received its second United States patent this past June, US 9,679,489, entitled “Ride Chaining”. The patent marks the second issuance for Lyft, and the company currently has two issued patents and four published, pending patent applications. The ‘489 patent covers a system and method to efficiently utilize driver capacity, where riders with similar starting and ending points and times are matched so that they can share a ride. The patent states that “[i]f two riders request similar rides (e.g., with similar start points and end points) or rides that overlap significantly at points closely in time, the ride can be shared. 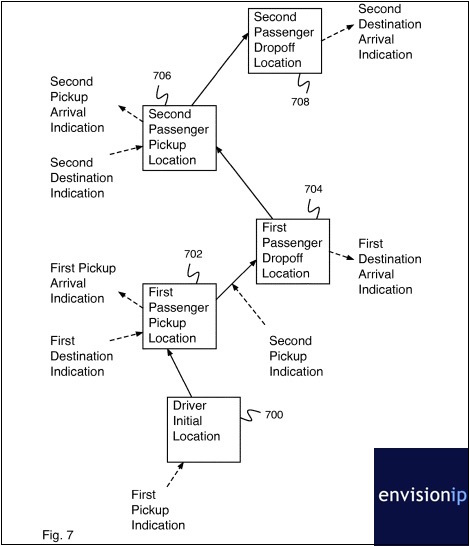 If both requests are received by the driver dispatch server system within a predetermined window of time, the driver dispatch server system determines that the rides should be shared, determines the correct order of stops (e.g., pick up passenger 1, pick up passenger 2, drop off passenger 2, drop off passenger 1), and provides the route to the driver.” (Col. 2, Lines 54-63). The claims of the ‘489 patent appear relatively broad, which is surprising given a recent priority date of 2014 for the patent. Furthermore, a number of earlier filed patents and applications assigned to Uber were cited by the USPTO examiner during prosecution of the ‘489 patent. These applications appear to cover unique aspects of the ride-sharing industry. US 20170193625 entitled “Driver Supply Control” provides a system to inform drivers of when there may an expected surge in demand, and allows drivers to plan work shifts based on the increased rider demand. US 20170193523 entitled “Driver Screening Including Mentoring” is also interesting. The application relates to testing drivers with a mentor prior to approving them to drive; essentially a secondary driving test in addition to a traditional driver’s license test. We expect to see more patent application continue to publish for Lyft in the coming months and year, as it is clear the company is attempting to protect unique aspects of its ride-sharing platform. Despite the latest additions to its patent portfolio, Uber still continues to dwarf Lyft in terms of patents.